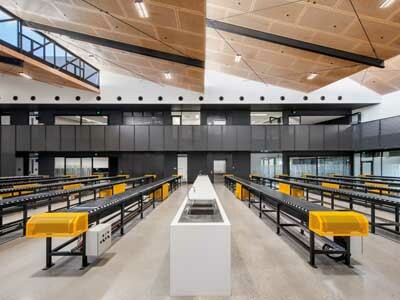 Perforated plywood panels from Keystone Linings were installed as part of an inspired raw materials palette to meet important design objectives at the South Australia Drill Core Reference Library in Tonsley, SA. Designed by local firm Thomson Rossi, the South Australia Drill Core Reference Library showcases the state’s resource wealth through a collection of drill core samples that outlines the geological footprint of the state. The building design takes inspiration from mining sites and geological formations, which is reflected in the raw materials palette consisting of solid and perforated Corten steel panels as well as articulated precast panels that are ‘rhythmic and are evocative of geological formations’. Keystone Key-Ply perforated plywood panels were supplied cut to size, ready for installation by Laser Linings. The design of the South Australia Drill Core Reference Library was recognised with four prestigious awards including: AIA National Colorbond Award for Steel Architecture 2016; AIA SA Commercial Architecture Award 2016; AIA SA Colorbond Award for Steel Architecture 2016; and AIB SA Professional Excellence Award 2016 for Commercial Construction $10M to $50M. Key-Ply is available in a range of sizes, grades and finishes, including the new 3-metre jumbo birch sheets. Architects, interior designers and builders can consult with Keystone’s dedicated architectural consultants and project managers for technical support, product specifications, design possibilities and costing.